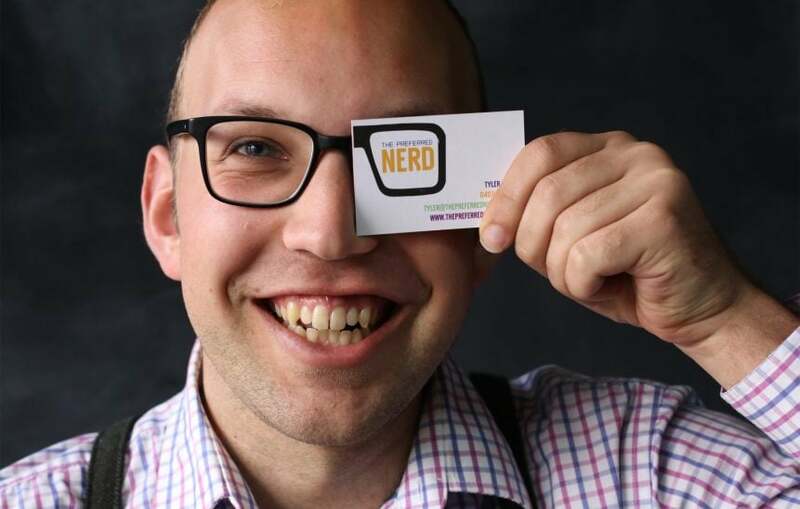 The Preferred Nerd was started in November 2016. I’d hit a point where I decided I wanted a better control of my own work-life balance, and decided that running my own business was the best way to take control. The decision as to what I wanted to do was easy: I’d worked in I.T. for years already, and found a common thread: we could fix their computer, but would send them elsewhere for a website, who would send them to a different designer, who would send them… it went on and on. I.T. was already confusing enough, and I could see the frustration people had. I could do all of those things, but our business wasn’t setup to do it. So I decided: when I started my own business, I would do it all. And if I couldn’t do it myself, I’d ask them to trust me to organise it for them. All-in-all, I wanted to be a one-stop-shop! Then I needed a way to get that idea out there: a name that let people know I was more than just a “computer” or “website” guy. Around the same time I broke my glasses (and my nose!) and had to buy a new pair (of glasses. Not noses…). As fellow-glasses wearers can attest: glasses make up a big part of your look. You wear them all the time with all of your outfits, and they reflect your style and personality. Already working in IT and wearing glasses, I decided that I’d stop fighting my image and to embrace my stereotype: I admitted and fully welcomed being a “nerd”. And so with the right timing and an unfortunate accident, like all other superheroes, I became The Preferred Nerd. I’m not just a nerd. When I’m not fixing someone’s computer, I’m probably doing some volunteer community work. And if I’m not working at all, I could be tinkering on a personal project, watching a good comedy, hanging in local cafe’s, out on the river, or spending time with the beautiful people in my life. The Preferred Nerd enables me to live my life outside of work, and I hope I can use my skills to save other people’s time, and let them do the same. Bridge Street Boutique utilises the services that Tyler offers with Technology. He is very professional in his manner and comes inside and is able to deal with any computer, hardware or software issues we encounter. Thank you for a great service in this region. Would thoroughly recommend The Preferred Nerd! Tyler is brilliant. Saved me and my business many times! I was recommended the Preferred Nerd computer services in Murray Bridge for help with a complicated ongoing problem on my laptop. Tyler was efficient, professional and was able to explain the problem in layman's terms. I was given excellent advice on how to make my home computer, mobile and tablet more efficient... I.T. 's not my comfort zone at all however Tyler's patience has given me confidence to do more. I'm sure there's a way we can help your business. Just ask. We promise to check our emails! © 2016 The Preferred Nerd, All Rights Reserved.